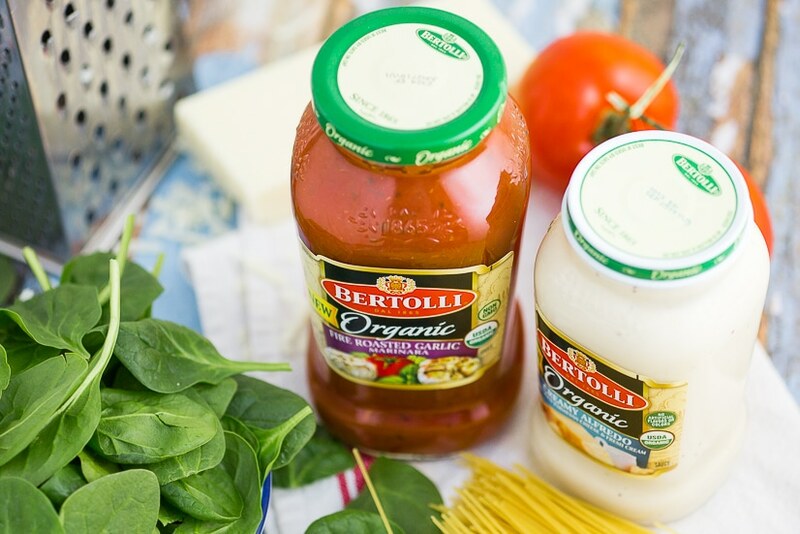 This post is sponsored by BabbleBoxx.com on behalf of Bertolli®. One Dish Baked Cheesy Chicken and Pasta with a creamy tomato marinara pasta, spinach, mozzarella, and Parmesan topped with juicy chicken breast. 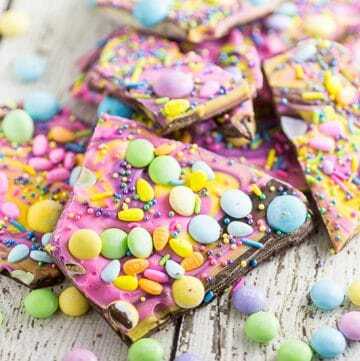 Mix it all together and bake for a simple, easy and delicious one dish meal! There is something about pasta that is naturally satisfying, enriching and comforting. It’s no wonder because pasta is the perfect dish for versatility. Cooler weather outside makes for the perfect warm pasta dish served up as the best comfort food. Bertolli pasta sauce helps make it easy to bring Tuscany to your very own table. 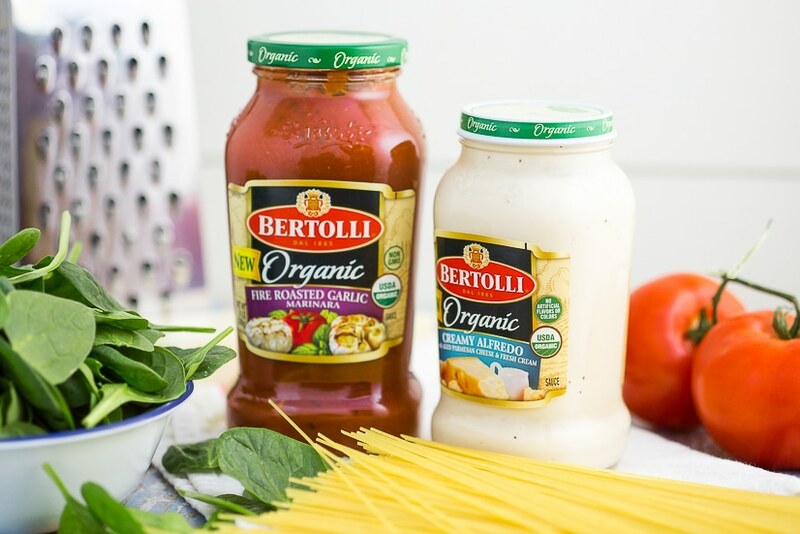 Our family loves pasta, and we love experimenting with new recipes or whipping up old favorites with Bertolli sauces, made with natural ingredients. 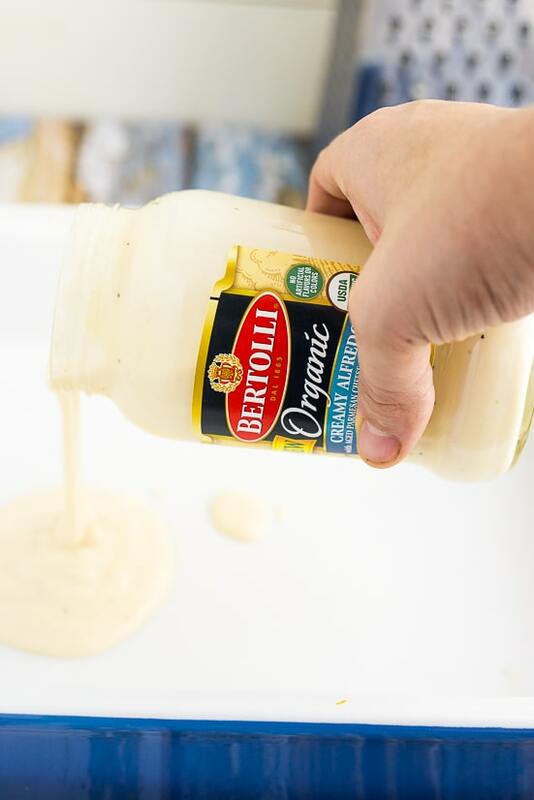 Bertolli believes in The Tuscan Way of cooking with just a few simple, quality ingredients to make classic flavorful dishes. It’s something we definitely agree on. Simple is best! Don’t mess with the classics! Bertolli uses this philosophy in the making of all of their sauces, too. Especially their new Organic sauces (like the ones we’ll be using today! ), which are USDA organic and non GMO. 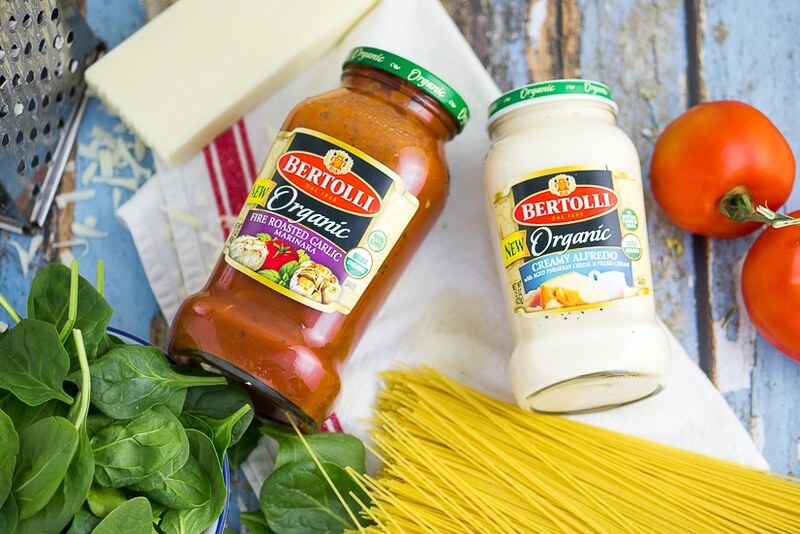 Bertolli sauces are made with simple, natural, and fresh ingredients like plump tomatoes, extra virgin olive oil, and Romano cheese. The kind of ingredients that make you feel good eating or feeding your family (especially if one of your New Year’s goals is to eat healthier!). 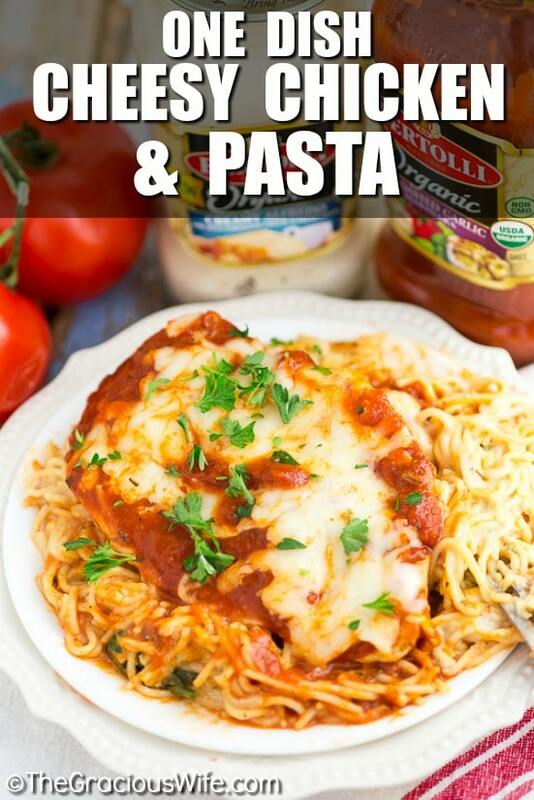 So now that my mouth is watering from all this Rosa talk, let’s talk more about this One Dish Cheesy Chicken and Pasta recipe. It is So. Easy. And SO. Good. Basically, you throw most of the ingredients in a 9” x 13” baking dish. Stir angel hair, Bertolli® Organic Creamy Alfredo Sauce, water, spinach, cheese, and seasoning in the dish. Place some chicken breasts on top. 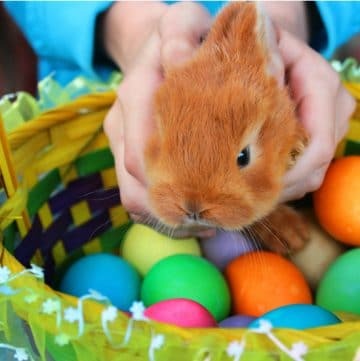 Then throw it all in the oven for thirty minutes. 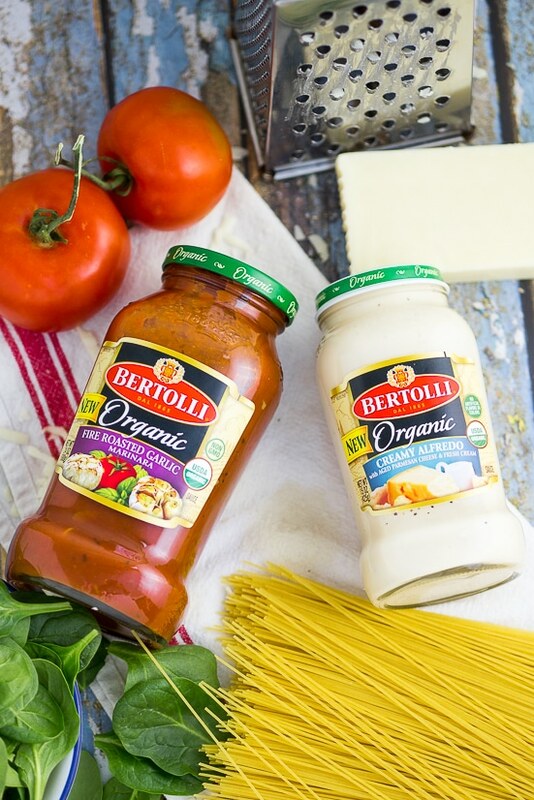 Take it out for a second to pour Bertolli® Organic Fire Roasted Garlic Marinara Sauce on top and add some more cheese (Yes, more. I don’t think you can ever have too much cheese!). Pop it back in the oven to melt the cheese, and voila! A full, simple, creamy, zesty dinner is ready to be served. And I guarantee it will be a hit. If you’ve fallen in love with the Rosa sauce (and I promise, you will) and are dying for some more recipes to try, check out these delicious Rosa Sauce inspired recipes. 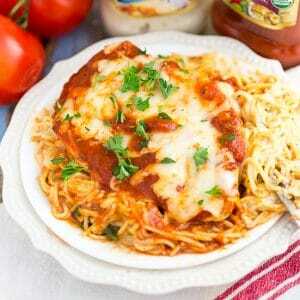 Break angel hair noodles in half and place in a 9"x 13" baking dish. Add Bertolli Organic Creamy Alfredo Sauce, chopped spinach, 2 "jars" water, grated Parmesan, 1/2 cup mozzarella, Italian seasoning, and garlic powder to the baking dish with pasta. Stir to combine. Season chicken breast with salt and pepper. Place chicken breast on top of angel hair mixture. 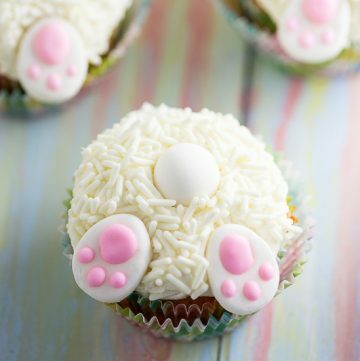 Bake in a 400-degree oven for 30 minutes, until noodles are done and chicken is cooked through. Remove from oven. 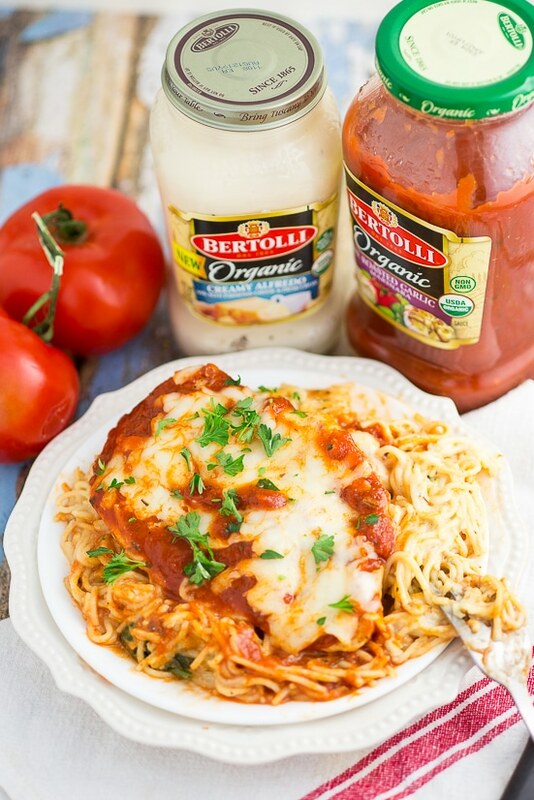 Pour Bertolli Organic Fire Roasted Garlic Marinara Sauce over the whole dish. Top with remaining shredded mozzarella. 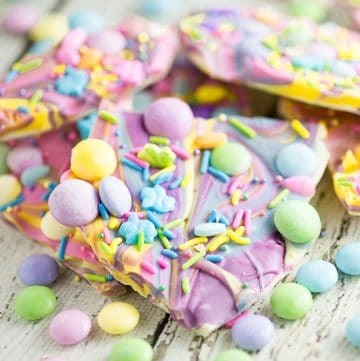 Bake for an additional 10 minutes, until cheese is melted and bubbly.